With Long Island’s largest vineyard of Pinot Noir, and an equally-sized vineyard of Merlot, McCall focuses on crafting low-yield, quality-driven wines. The original vineyard (planted in 1996) and surrounding farm are in the town of Cutchogue, which the McCall family has called home for generations. The home of McCall Wines is an old potato barn previously used as a horse stable. The rustic tasting room is there, with its collection of old tools decorating the barn walls and the concrete buttresses reinforcing the walls a constant reminder of the North Fork’s agricultural past. There it sits on the property, surrounded by an expanse of lawn and a charming, pastoral feel to it, with Charolais cattle grazing in the adjacent pasture. Until roughly three hundred years ago, Downs Woods and the adjacent McCall vineyards were the cultural center of an Algonquin Indian tribe. Known as Fort Corchaug, these natives long ago selected this unique maritime area along the estuary as their home. About two hundred years later, in 1902, Russell Simeon Walker, president of the Dime Savings Bank in Brooklyn, rode his horse and buggy out to the North Fork to find a summer home. From the Walkers to the Munkenbecks down to the McCalls, the property has remained in the family for generations. For years Russell McCall worked as a distributor for high-end wines in Atlanta, Georgia, but an offer too good to turn down led him to sell the business and return to Long Island. Hence his interest in fine wine found a home for making his own. And he knows what he wants. The addition of a wind turbine in 2010—the first for a farm in Long Island—has provided the clean wind energy; enough that it also supplies clean power to the Long Island Power Association. In the same year, McCall began ranching organically grass-fed Charolais cattle, which graze in the fields by his vineyards. There are 50 head of cattle, of which 10 to 15 are sent to an abattoir each year and the meat is then sold to high-end restaurants as well as at the farm store. The animal feed on grasses that have not been chemically treated for 15 years, so effectively organic. With the use of innovative techniques such as recapturing spray, they manage to limit the use of pesticides and herbicides and ensure that they don’t dissipate from the vineyard or affect either the neighboring preserve or the Charolais cattle, not to speak of the native wildlife, so that on any given day one may see foxes, pheasant, deer, hawks, turtles, wildflowers and more. 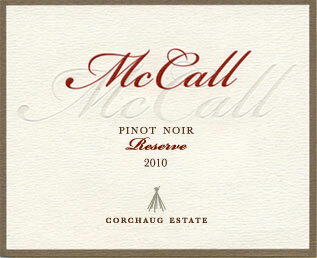 Committed to quality and sustainability, McCall released his first wines in 2007. Since then, they have found critical acclaim. They can be found on the wine lists of a handful of upscale restaurants in New York City and on the East End. The original vineyard that Russell McCall planted in 1997 is referred to as Corchaug Estate. This vineyard was established on land rescued from development that borders the historic Fort Corchaug site and Down’s Woods preserve. The estate also includes our tasting room, an existing barn reclaimed as a place for visitors. The southern end of the vineyard is planted with 11 acres of Pinot Noir, comprised by four clones selected from the best French clonal varieties grown in the Willamette Valley of Oregon, comprised by four clones: Pommard 4, and Dijon 667, 777, and 115. This is to date the largest successful Pinot Noir vineyard on Long Island. Based on the French tradition, the vines are spaced closer than most in the region. On the north end of the farm the soil is rich with clay much like the best vineyards of Bordeaux, especially Pomerol, where there are ten acres planted with three clones of Merlot. Just north of Corchaug Estate, across Route 25, lies a 16-acre vineyard planted by Dr. Peter Gristina in 1983. The neglected old vine Cabernet Franc, Cabernet Sauvignon, and Chardonnay plantings were taken over by the McCalls in 2010, who first leased it for three years to assure the quality of the fruit, as the vines were not all in good shape. While rejuvenating them they found that the vines produce excellent fruit, and expanded the vineyard by adding a block of Sauvignon Blanc once the property was purchased in 2013. The land is unique in its hilly relief and the inclusion of a large kettle hole nestled in a parcel of protected forest. The glacial terrain, mostly sandy loam, has a positive effect not just on the drainage of the vines, but also the characteristics of the fruit. McCall is quite candid in saying that He doesn’t always produce Pinot Noir successfully. A major reason for that is the unpredictable weather from year to year, a problem that is common for a maritime, cold-climate region. It is a difficult grape to cultivate because it is so sensitive the vagaries of clime and weather so that both yields and quality can be highly variable. These are reasons that it’s called the “heartbreak grape,” but what makes it worthwhile is how splendid a wine it can make in a good year. The McCall Pinots have received high praise from the NY Times, Wine Advocate, and Wine Enthusiast. He predicts that the 2014 vintage has potential for greatness. The weather was sunny and there was nearly no rainfall for July, August, and September, creating dust-bowl conditions, bad for grass but terrific for grapes like Pinot Noir. By September the fruit was fully ripe and was all harvested; indeed, the Pinot is always picked between the 10th and 20th of September from the time that the vineyard was planted in ’97 with over 22,000 vines. For example, in a humid climate such as Long Island’s, it’s necessary to start leaf-pulling early to expose the fruit to the sun and air so as to keep disease at bay. If needed McCall will have as many as 20 workers out in the vineyards pulling leaves. Indeed, at harvest all the grapes are picked by hand, for he doesn’t believe that mechanical harvesting has been perfectly sufficiently to be used for harvesting high-quality fruit. Furthermore, very much in the French tradition the vines were planted just three feet apart, which makes it even more difficult for machines to work in the fields. In other words, the vine density is about 2050 plants an acre given a 3×7 spacing. An important advantage of such close spacing is that it forces the vines to compete for water and rather than spread roots more or less horizontally they are forced to dig down into the soil—one of Helen Turley’s many axioms about winegrowing (in Russell’s eyes she is a genius). The result is that about two tons of grapes are taken from each acre, resulting in a total production of just under 5000 cases a year, depending on the vintage. As for the future, Russell has three children, of whom but one may be interested in taking over, but it’s not yet his time. In 2013 McCall was rated “Best Winery in New York” by the NYWGF. And in 2015 three of its wines were rate 90 or more in The Wine Advocate. McCall’s makes two whites, a Chardonnay and a Sauvignon Blanc, that are quite good, especially as food accompaniment, but the winery’s real claim to fame is its reds, particularly the Pinots. The 2010 Ben’s Bordeaux Blend is a wine that is only possible to craft in a great vintage like 2010. It’s produced from the best estate Merlot, plus three other varieties: Petit Verdot, Cabernet Sauvignon, and Cabernet Franc in roughly equal proportions. The blend of these Bordeaux grapes, often known as a meritage, is named for McCall’s late vineyard manager Ben Sisson. Drinking well now, it will continue to age well as a collector’s wine. The 2010 Merlot was highly praised by Wine Advocate (90 points) as an excellent food wine, given its somewhat understate though beautifully balanced style. All the wines except for the Pinots are made by Gilles Martin, a highly-regarded consultant winemaker, at PWG. The 2010 Reserve Pinot Noir is made from 100% estate-grown and hand-selected fruit from the very best grapes in the Corchaugh vineyard, the 2010 reserve shows intense fruit and subtle earthy and mineral notes with a hint of the sweetness of French oak. Extremely low yield, due to green harvesting, the 11-acre vineyard has intensified the deep essence of the variety. A wine like this is only possible once in a five to eight-year weather cycle. It is best to decant and drink now or to save it until 2017 or after. It was named “Best Pinot Noir in NY” at the 2013 NY Wine & Food Classic. The New York Times’ Howard Goldberg had this to say: “The star was the sophisticated 2010 Corchaug Estate reserve from McCall Wines in Cutchogue, which specializes in the grape; its combined breadth, depth and length was world-class (as its price might suggest). McCall’s regular 2010 Corchaug Estate ($39), almost as serious, was round and plummy.” Both are made at Millbrook Winery in the Hudson Valley for McCall by John Graziano (winemaker) and Bob Cabral (consultant). This entry was posted in Vineyards, Vinification, Viticulture and tagged Bob Cabral, Gilles Martin, John Graziano, Long Island wine, McCall VIneyards, North Fork AVA, North Fork wine, Russell McCall on 26 December 2015 by JoseM-L.